The World Pilot Gig Championship is split up into three main categories; Super Vets (50+), Vets (40+), and the Open (16+). Each category is sub-divided into Men's & Women's. As of now there is no mixed races or crews in the WPGC. A breakdown of the 2019 timetable can be found here. 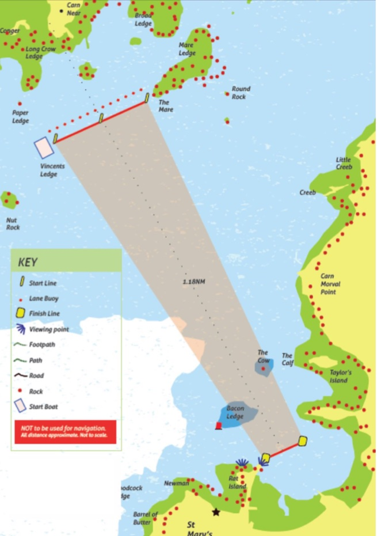 For a printable copy of the WPGC 2019 race breakdown please see our Information Pack page. The first race of each division is the St Agnes Down. 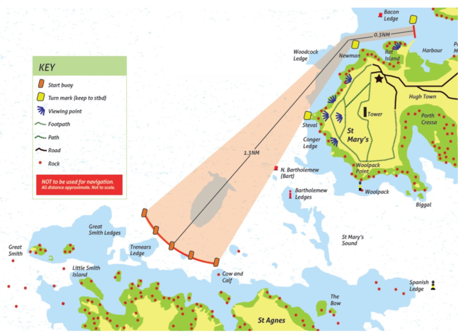 The map to the side shows the course breakdown, including the start line breakdown & finish line in St Mary's Harbour. The gigs are arranged alphabetically and the start line is setup so that no crew has an unfair advantage in terms of distance raced. Your boat must start with in the boundaries of your allotted bay. All completing crews/gigs star this race at the same time. In the Super Vets & Vets only the top 12 boats will do the Nut Rock Final. This is a new race for the 2020 WPGC and will take place on the Saturday. In the standard group there will be three Nut Rock Races. Each of these races will give the crews a chance to move up in the standings. The top two boats from each group will move up a group, while the last two boats will go down a group. Everyone who finished 3rd-9th will remain in the same Group. Example: Bonnet, Nornour, and the Serica are in group C. They all finished between 25th & 36th in the St Anges race. In their first Nut Rock Down the Bonnet came 2nd, the Nornour came 5th, and the Serica came 10th. The Bonnet will now move to group B, the Nornour will stay in group C, and the Serica will move down to group D.
The Races themselves will take place in descending order, Group A will always be the last group to race each set.